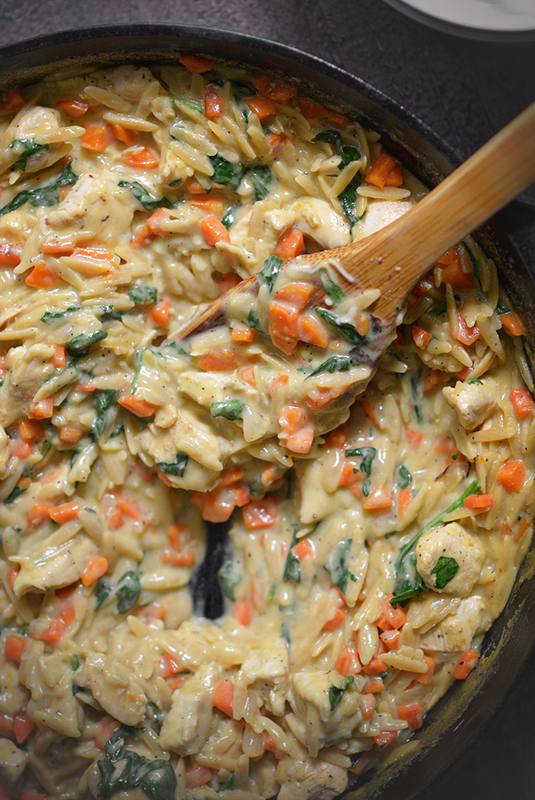 Creamy One-Pot Chicken, Carrot, and Spinach Orzo – Spring can be a crazy time with school-aged kids. Thankfully, this 30-minute-meal makes it easy to balance a healthy dinner with all those end-of-year activities! I can’t believe it’s already May and nearly the end of the school year. My oldest is in first grade and his school is holding Kindergarten Day today. Basically, that means all of the incoming kindergarteners for next fall get to visit a kindergarten classroom while their parents are given all kinds information about what to expect when their little one starts school. According to Mr. Simple Seasonal, there was some excitement at the bus stop this morning, because the sister of my son’s best buddy is going to be one of the visiting kindergarteners. My son adores her and I think he’s looking forward to her joining the rest of the neighborhood gang at school next year (even though she’s a girl and all). 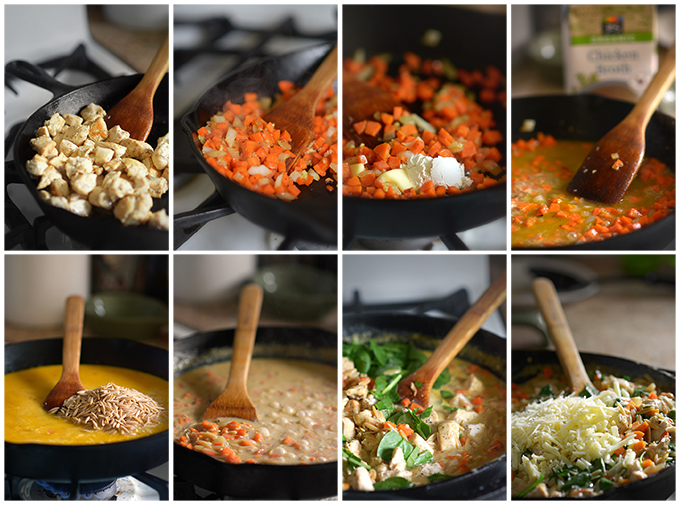 With the craziness of May at hand, it’s officially become 30-minute meal month in my home. 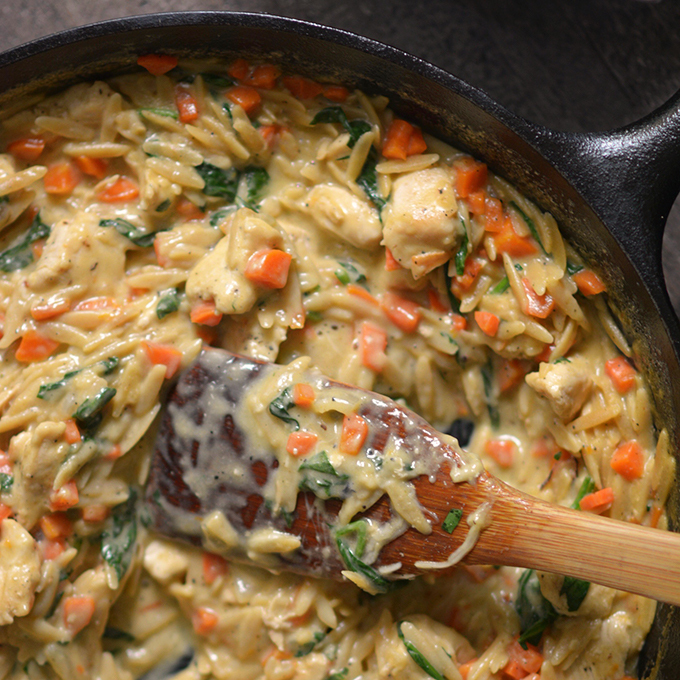 My latest addition to my 30-minute meal repertoire is my Creamy One-Pot Chicken, Carrot, and Spinach Orzo. 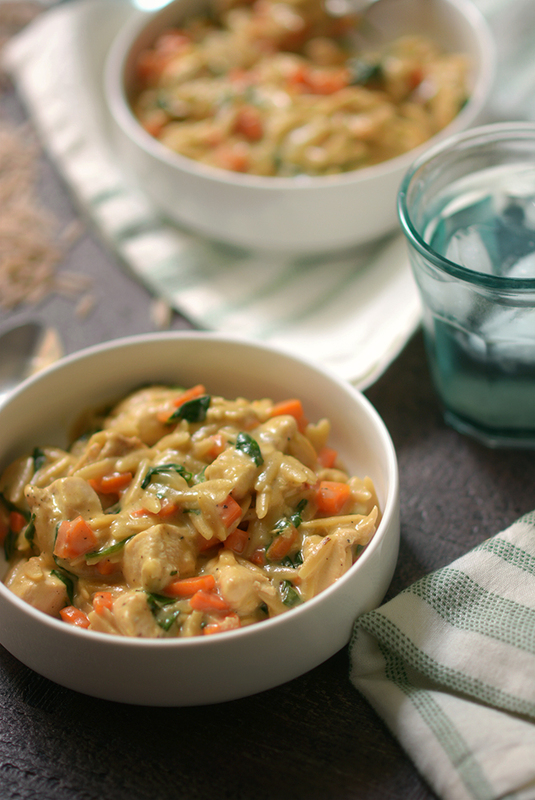 It’s ridiculously easy to make and it’s a balanced meal. 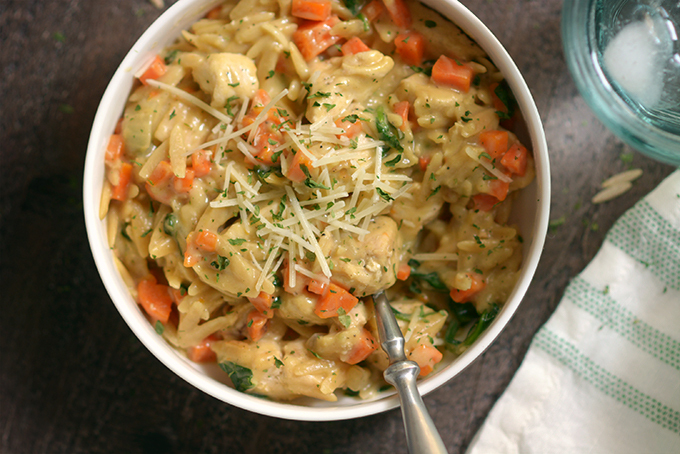 It’s creamy, cheesy, flavorful, and comforting. And did I mention? All of that creamy cheesiness hides the spinach that is going to keep your family healthy and having fun through the month of May! Spring can be a crazy time with school-aged kids. Thankfully, this 30-minute-meal makes it easy to balance a healthy dinner with all those end-of-year activities! Trim excess fat from the chicken breast, cut into bite-sized pieces, and then pat dry with a paper towel. Season with salt and pepper to taste. Heat 1 Tbsp of olive oil in a large skillet over medium-high heat. Once heated, add the chicken and cook for 6-8 minutes or until it is cooked through. Transfer the chicken into a bowl and set aside. Reduce the pan to medium heat and add another tablespoon of oil to the skillet. Sauté the sweet onion and the carrot for about 3 minutes or until they begin to soften. Add the garlic to the skillet and cook one more minute. Season with salt and pepper to taste. Add 1 Tbsp of butter to the skillet with the vegetables and cook until melted. Next add 1 Tbsp of flour and cook for 1 minute, stirring to evenly combine. 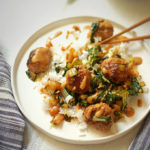 Once the flour is cooked, slowly add in the chicken stock while constantly stirring to evenly incorporate it with the flour while avoiding lumps. Next pour in the milk and add the orzo. Turn the heat up to high and bring to a boil and then reduce to a rapid simmer. Cook for about 5-7 minutes*, stirring every couple of minutes to prevent sticking. Cook until the pasta is al dente or to your desired softness. If the orzo begins to dry out before it is cooked through add an additional ⅛ C of chicken broth to the pan as needed. Add the chicken back into the pan and also add the chopped baby spinach and cook for 1 more minute. Lastly stir in the grated cheese and season with salt and pepper to taste. Serve immediately. *I have whole wheat orzo pictured here, which requires an additional ½ C of chicken broth and a cooking time of 9-11 minutes. I just bought some orzo and am so ready to use it! I love that this is made in one pot! I’m happy to hear that your orzo now has a purpose! 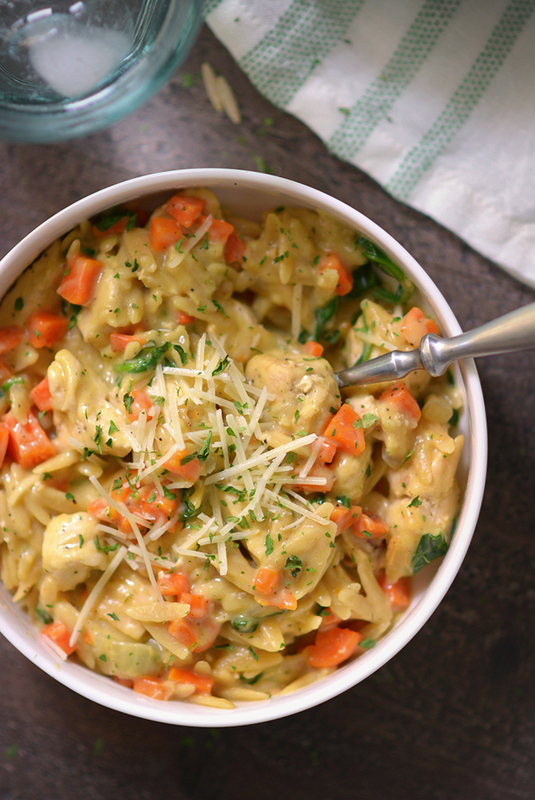 This looks like the perfect comfort food. Great recipe! 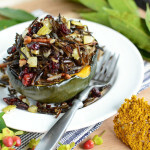 I love this meal because it has something in it for everyone! This is definitely going in my rotation to be used regularly! Thanks! Thanks Mackenzie! 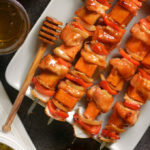 I’m glad this recipe is one you can add to your repertoire of recipes! I’m in the middle of the May craziness with my kindergartener now – we only have a few weeks left of school and it has been a whirlwind! 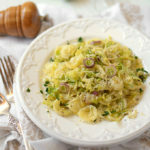 This looks like the perfect comfort food dish to combat our hectic schedule! You can make it to summer break! 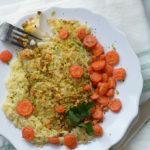 This really looks like a dish that I would love. 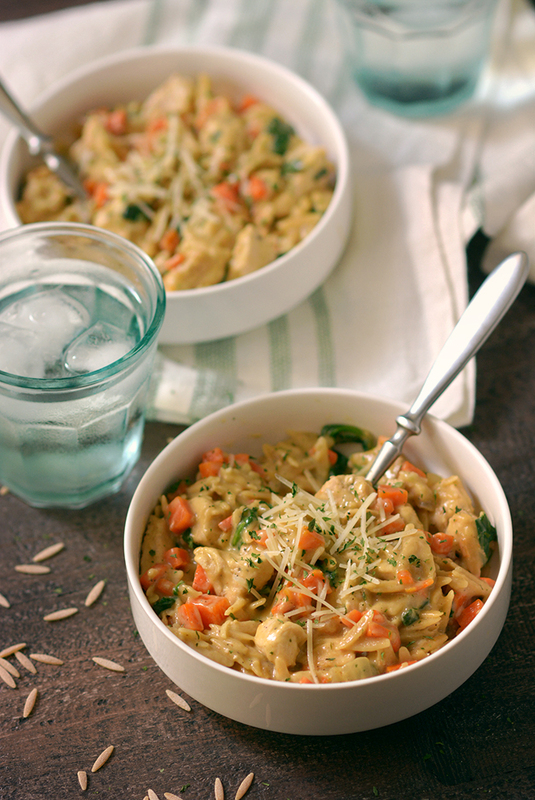 All the creamy, ricey, goodness? yummers! What an easy hassle-free recipe I’ve found. This one is definitely happening for dinner tomorrow. 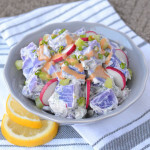 Its creamy and so much flavor. WOW.. Thank you for this one !! I’m glad you found what you were looking for Pearl. Enjoy! That looks so beautifully creamy! 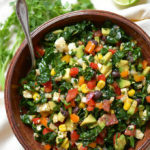 I love that kind of skillet dinner – everything sharing flavor with everything else! I agree that the sharing is a good thing when it comes to dinner flavors… just not when it comes to my actual dinner! 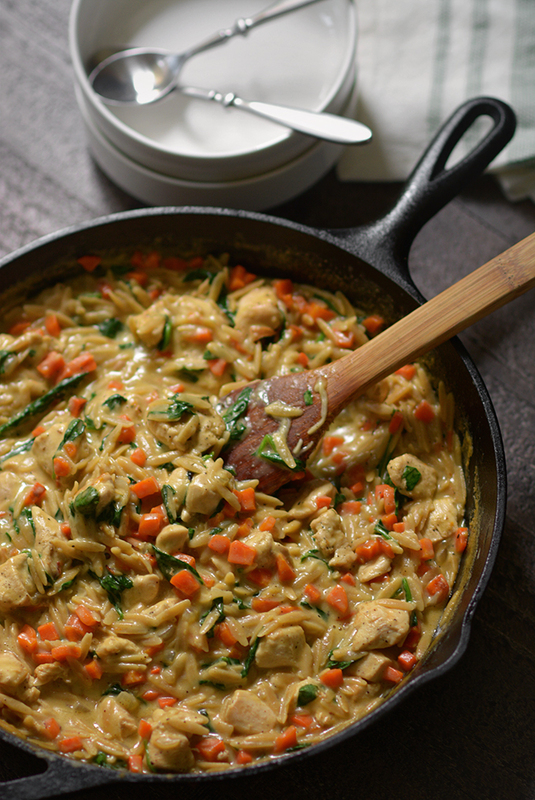 wow this looks so creamy delicious,I love one pot recipes too! 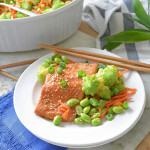 This looks so easy to make and would be perfect for a weeknight dinner! It’s awesome that there is protein, veggies, and carbs all in one. Love this dish! That’s what I was going for! An all-in-one balance meal for the whole family! Glad to give you some orzo-spiration! As a teacher I have to agree with you about the month of May! It’s so unbelievably busy and I always feel like I’ll never get everything accomplished in time. Easy one pot meals like this are my go to during this time of year! I can’t imagine how crazy May must be for teachers! I hope you enjoy this, quick, one-pot, comfort food meal before diving back into grading! 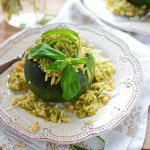 This orzo looks and sounds amazing! Love your step-by-step photos and instructions. Thanks for sharing! I’m happy that the step-by-step photos are helpful! I am pinning this on my dinner board. This look incredible and your photos are really awesome! Your photos are fabulous! Despite the fact that I just had dinner, I am imagining how great this would taste! I have a feeling my family will love this dish! Thanks Sara! I hope your family enjoys it!